In a previous entry, I reproduced the talk that I presented in May at Left Forum 2015. In that talk, I gave a general update on the underground press digital project. In this entry, I want to focus on one important segment of that community, the Chicano papers. “Chicano” is a term that you don’t hear often nowadays. Members of the Mexican community in this country are more often known by the terms “Hispanic” and “Latino,” both of which seem to be either softer terms coming from the communal desire of Mexican immigrants to be accepted in this country with a path toward citizenship; or else the desire of the corporate press and mainstream political establishment to blunt Mexican-American progressive activism. “Chicano,” on the other hand, was the self-identifying term used by members of the politically radical community from the sixties and seventies as they demanded equal justice in the fruit and vegetable fields and by educators in Arizona and other states as they demanded Chicano Studies programs on campuses. Cesar Chavez and the United Farm Workers were Chicanos, not Hispanics or Latinos. Members of Mexican American Youth Organization (MAYO) and their political party, Raza Unida Party, were Chicanos, not Hispanics or Latinos. Writers and editors of the many underground and alternative newspapers that originated in that community during that period were Chicanos, not Hispanics or Latinos. Veterans of the period who are active today still refer to themselves as Chicanos, not Hispanics or Latinos. When I was compiling histories of different underground and alternative newspapers for the first edition of Voices from the Underground, I only knew of one major Chicano paper, El Malcriado, the newspaper of the United Farm Workers. I invited Dolores Huerta, a co-founder of the United Farm Workers with Cesar Chavez, to write a history. She was unable to accept my invitation. That was it for my effort to include a Chicano paper. Even in its revised second edition, Voices from the Underground doesn’t have Chicano representation. Everyone’s loss. My consciousness and my knowledge have greatly expanded since I began working on this digital project. Chicano papers are well represented. But I still am looking for more. So, I am pleased to present, in this entry, the Chicano papers that are on board already to be digitized and some of those that I still hope to bring on board if, with the help of readers, I can locate veterans of the papers to give me permission. Gaining access to original copies of most of the papers is not a problem as we are working with a growing team of sourcing libraries that own original copies in their collections and are only too happy to share them with us. El Alacran, Basta Ya!, Bronce, Carta Editorial, La Causa, CCR Newsletter, Comisión Femenil Mexicana Nacional, Con Safos, El Corno Emplumado, La Cucaracha, El Diario, El Gallo, El Grito del Norte, La Guardia, La Hormiga, In Fact or Fiction, Inferno, Inside Eastside, Luz del Sol, El Machete (Los Angeles), El Machete (San Jose), Maguey, (MAYO) El Azteca, (MAYO) El Deguello, (MAYO) El Despertador, (MAYO) El Golpe Avisa, (MAYO) Hoy, (MAYO) MAYO Times, (MAYO) La Revolución, Nuestra Lucha (Homestead, FL), Nuestra Lucha (Toledo, OH), El Paisano, Palante, Pamoja Venceremos, Prensa Popular, El Pueblo Obrero, The RAG, Regeneración, El Renacimiento, El Servidor, Sol de Aztlan, Third World, El Tiempo Chicano, Triple Jeopardy, Venceremos, ¡LA VERDAD!, La Vida Nueva, La Voz de Los Llanos, Voz Fronteriza, La Voz Hispana de Colorado, and Ya Mero!. El Chicano, Chicano Student Movement, Chicano Times, La Chispa, El Clarin Chicano, Compass, Es Tiempo, El Papel, Raices, Raza de Bronce, La Raza Nueva, Salt, and El Yaqui. Ahora Now, Chicana Service Action Center (CSAC), Claridad (U.S. Supplement), Coraje, Encuentro Femenil, The Forumeer, Fragmentos de Barro, La Gente, El Grito: A Journal of Contemporary Mexican-American Thought, Hijas de Cuahtemoc, LADO, Lowrider Arte, Magazin, El Malcriado, Noticias, Nuestra Cosa, Papel Chicano, Pitirre, El Popo, El Portavoz, La Razón Mestiza, La Voz, La Voz Mexicana, YLO, and El Young Lord. Who do you know from those papers who might be able to give me permission? How can I reach them; email and/or phone? Will you give me a personal introduction as you endorse the project? What papers do not appear in any of these three groups that should be part of the collection? These papers and most of the nearly 1,400 other papers that will find their way into the digital collection if we can get our full funding may be found scattered around the country on the dusty shelves of special collections libraries of our colleges and universities or in boxes stored away in private collections. They are yellowing with age, getting frayed around the edges, starting to crumble. Meanwhile, students and young activists do the majority of their research online. For many of them, if it isn’t online, it doesn’t exist. The underground press digital project, what we have named Independent Voices, is changing that. With your help, it can be even better. 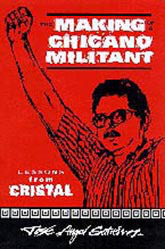 Recently I read the book The Making of a Chicano Militant: Lessons from Cristal, by José Ángel Gutiérrez. After finishing his book, I had the honor of communicating with him personally over email. José was a co-founder of MAYO and one of the key Chicano organizers of the sixties and seventies. He personally gave me permission to include nine of the above newspapers in this collection, mostly those associated with MAYO. Independent Voices is an essential tool to reverse that negative flow. If you are a veteran of the period, please contact me with information on any of the missing papers. If you represent a library or a progressive foundation, please contact me so that I can give you information on how you can support Independent Voices. Last month I noted on Facebook that I had won a business card drawing at a party held by Adams Sign Company, the company whose name you see at the bottom of about half of the billboards in the Ann Arbor area and throughout Michigan. From my understanding of the award, they were going to help me design four signs that would rotate on one billboard for a month of my choosing. I thought they would be the only four signs per rotation. I was pretty pumped. I met with two company representatives and talked through the content and design that I wanted and when and where I wanted the signs to appear. I knew what I wanted. Three signs would advertise my three latest book creations (two books, one four-volume series); the fourth would advertise my book coaching services. I knew exactly when I wanted them to appear: throughout July, which would include Ann Arbor Art Fair. I had two locations from which to choose: one on 23 South heading into Arbor from the north, the other on I-94 West heading into Ann Arbor from Detroit, at the Huron Road exit in Ypsilanti. I chose the second. And so they got to work. Meanwhile, my understanding of what I had won evolved. Emily suggested that my four signs would share rotations with possibly up to a dozen other signs. No, that couldn’t be, I insisted. But as I observed billboards with rotating messages, I concluded that, indeed, most had far more than four separate signs per rotation and mine probably would, too. Still, my own sign showing up every fourth sign, give or take, for a month was a pretty impressive use of budget dollars (which, remember, were $0). The day came when they went up. I was psyched. I waited a week to see them, building the psych juices. I brought Emily with me. We pulled over to the side of the freeway just inside the off-ramp to Huron Road and waited for the first sign to appear. We waited. And waited. And waited. Finally the first sign appeared. It looked great. It was so impressive, I wanted to buy the book. Then we waited. And waited. Alas, we discovered that my signs showed up in the same spot in every rotation, which meant that each sign appeared only once per four rotations. So I made an executive decision to dump the three book signs and keep only my book coaching sign. Meanwhile, I’ve displayed my four billboard messages throughout this blog entry. Nice?